ANTIQUES - GUNS - KNIVES - FURNITURE - CONSIGNMENTS will be included in this auction! Conducted by Dwight Angel, Auctioneer AU4267, DANGELCO Dwight Angel Companies. Contact Dwight at 850-509-0979. All goods sold as is, where is. Shipping is not available for furniture which requires warehouse pickup in Quincy, Florida. Furniture bid winners will be notified of contact person for pickup. Furniture must be picked up on either on 11/01/2018 or 11/02/2018, unless other arrangements are made with the designated furniture pickup coordinator. We have very limited space for storage of sold items. Furniture not picked up on one of the two pickup days will be moved to storage and stored at the rate of $3.00 per day, cumulative, not to exceed 30 days in total storage. After 30 days without storage charges payment, the items are considered in forfeiture and all rights and monies will be forfeited. Shipping is billed to the winning bidder credit card separately from winning bid payment invoices. Bidders authorize collection and retention of e mail for future auction announ cements and business correspondence including being added to our mailing lists. Absentee bids accepted until day of auction! Enter your bids! All goods sold as is, where is. Read terms and conditions. We will consolidate items in boxes when shipping and use US Post Office flat rate boxes whenever the item sizes allow it. Customers pay actual shipping charges plus a per box handling charge. To defer cost of staff shipping, including boxing, padding and packaging, all boxes shipped will be charged $2.50 per box. These are the terms of auction conduct for all auctions conducted by DANGELCO Dwight Angel Companies including all activities of all divisions; Dba's, Brands and Trademarks; including any live and online internet auctions; including all live and online auction sites. Dwight Angel is a federal firearms licensed dealer. Our auctioneer license number is AU4267. Dwight Angel Auctioneer. Our auction business license number is AB3729. 1. Bidder(s) agrees that the auctioneer and/or the auction company reserves the right to accept and/or reject any bid and/or bidder(s) participation in any auction. The auctioneer and/or auction business may cancel and/or terminate any participant's participation and/or membership at will and/or in the best interest of bidders, sellers, and/or the auction and/or auction business, in any auction, either live or online. 1.a. Bidder(s) and consignor(s)(s) agree that the auctioneer may cancel, postpone or re-schedule any auction at will, without penalty for doing so. 2. Bidder(s) must be legally able to participate to form a contract in their place of residence. 3. Bidder(s) must have a bill to name, address, telephone number, e-mail address and drivers license or state issued id to register for our auctions. 3.a. Bidder(s) agree to have their email address placed on the auctioneer/auction business mailing list for up-coming auction announcements when they register. BIDDER(S) AGREE ALL GOODS ARE SOLD "AS IS"
4. Bidder(s) agrees that terms of sales are "AS IS" - "WHERE IS", NO RETURNS, NO CANCELLATIONS. 5. Bidder(s) must be of legal age in the bidder(s) residence jurisdiction. 5.a. Bidder(s) agree not to bid on any item that is prohibited where they reside. 5.c. Bidder(s) agree not to bid on any item that is prohibited for the bidder to possess in their state, region or country to lawfully possess. 5.d. Bidder(s) agree not to place bids on firearms if it is illegal for the bidder to acquire or possess a firearm. 5.e. Bidder(s) confirm they have arranged and or secured an agreement with a federal firearms licensee that will receive a firearm(s) won at auction in their behalf. Bidder(s) agree no monies paid for a winning bid shall be refundable in event the bidder fails to arrange a firearm federal licensee to ship firearms to, within thirty days from close of sale and such failure shall constitute default under this contract. After a 5 days grace period from close of auction, secure storage of any firearm stored awaiting the designation of a firearm ship to licensee, shall result in a $5.00 per day, per firearm, storage charge, not to exceed 30 days from the date of close of auction . Designation of a ship to federal licensee can only be made via e mail to: angel.dwight@yahoo.com. 3) Bidders who are residents of states that touch Florida may purchase long guns only at auction and must receive FDLE approval to purchase long guns at auctions. 4) All buyers must complete US ATF Firearm Purchase Forms. 2) No FDLE call in approval applicable. 3) Firearm is being sold directly to purchaser by the owner. 6. We have contracted with AuctionZip to bill customer's credit cards through AuctionZip. When you are billed via AuctionZip in our behalf you agree to submit payment. Bidder(s) agree to use one of the following to pay for their winning bids, by selecting one of the following options; Paypal, Stripe, Credit Card, Check or Money Order. In event a self checkout method is not utilized bidder(s) agrees to pay the Square invoice we email the bidder, if other payment choices are not utilized. 6.a. Bidder(s) agree that winning bids may be charged to any credit card the bidder(s) have placed on file with the auctioneer/auction business/auction platform provider. ALL ONLINE AUCTIONS REQUIRE A VALID CHARGE TO CREDIT CARD. 6.b. Shipping charges are billed separately from winning invoices. firearm long boxes for shipping cost $15.00 each box. 7. Bidder(s) agrees all sales are final and may not be cancelled, revoked or ignored by the bidder. 8. Bidder(s) agrees to pay any online auction invoice(s) upon receipt. In event an invoice is not paid withing 24 hours of the ending date of the auction, all rights to purchase the item for the bid amount may be terminated at will of the auction business. 9. Bidder failure to pay for an item will result in bidder authorization of membership being cancelled and/or revoked. 10. Consignor(s) affirm they are the lawful owners of all consigned merchandise and no liens, claims and/or encumbrances exist on the property being consigned whatsoever. 10.a. All serial numbered property is entered into the Florida Crime Information Center. This database contains Florida stolen property information as reported to the Florida Department of Law Enforcement by law enforcement agencies throughout the state and authorized for release to the public. Any item which returns a want and/or is reported stolen, will be turned over to the Gadsden County Sheriff Department. 10.b. In event any item is seized and/or turned over to law enforcement due to stolen property claims, the consignor(s) shall incur complete and total losses and the auctioneer and/or auction business shall in no manner be liable for any loss. 10.c. In event of fire, theft, man made disasters or acts of God, the auctioneer, auction business and/or Dwight Angel, and/or DANGELCO Dwight Angel Companies, SHALL NOT be held liable for damages or loss, including economic loss and/or all other types of loss which may take place. The consignor and or bidder agrees to provide sufficient insurance for the consignor and/or bidder interest in any property offered for auction, or held in storage for either a consignor and/or bidder. 10.D. At any live auction bidder(s) agree that they alone are responsible for their winning bids which are made on their bid number and agree to be totally responsible for safeguarding their property once an item is won at auction. 11. The jurisdiction/venue of this auction is located exclusively in Gadsden County, Florida and all bidder(s), consignor(s) and/or visitor(s) agree the venue shall not be subject to change. 12. Consignor(s) agree to all of the terms and conditions of auction when consigning an item(s) to the auction business. 12.a. Consignor(s) agree that the Buyer's Premium is collected for the auction house or auction business, and it is an earned commission charged when selling any item for sale at auction. Consignor(s) agree the buyer's premium is earned income of the auction house. The buyer's premium is set at 20%. If an buyer pays by cash or money order the buyer's premium is reduced to 15%. 12.b. Bidder(s) and Consignor(s) hold harmless the auctioneer, auction business and/or auction house in any action, claim, suit or legal action, which may arise from selling merchandise at auction, accepting the auction terms of "AS IS", "Where Is", without guarantee or warranty. 12.c. Bidder(s) and consignor(s) accept all risk related to purchasing and/or selling auction items. 12.d. Bidder(s) agree to obtain owners manuals and/or obtain any training required to safely operate any item purchased at auction. 12.e. Bidder(s) and Consignor(s) agree that there is no warranty whatsoever on items sold at auction. 12.f. Bidder(s) agree to hold harmless the Auctioneer and/or Auction Business in event a product supplier is unable to furnish an auction item and/or an auction item is broken, damaged or lost, and in such event, the bidder payment for the item will be refunded with shipping charges included, and no other auction, penalty or remedy shall be available to the original winning bidder, it is agreed. 13. Bidder(s) agree that shipping of goods will be accomplished via the US Postal Service flat rate boxes when item shipping is permitted under post office rules. Bidder(s) agree that UPS will be used when shipping of any item(s) is prohibited by US Postal Service rules. Bidder(s) agree to pay set post office flat rates when indicated in an items auction listing or pay total shipping charges for items combined using flat rate mail. Boxes shipped include a $2.50 per box handling charge for labor, packing and bubble wrap materials. Bidder(s) agree that shipping will be billed separately when items are being combined in US Postal Service flat rate boxes. 14. Bidder(s) agree that item contents shipped by the auction house will be insured to protect against damage, loss or theft, at the amount paid for the items at auction, unless specifically instructed in an email not to insure items at the price paid at auction for the boxed contents. Shipping insurance is an included part of the shipping bill. Winning bidder(s) agree to have items shipped to the address on their drivers license unless an e mail is sent instructing us otherwise. 14.a. When items are too big to ship by Postal Service boxes or boxes that are reasonably available to the auction house, the winning bidder(s) agrees to arrange for item pickup, crating and shipping themselves, at the winning bidder(s) expense. 14.a. The auction business and/or auctioneer shall incur no liability whatsoever in event any item is damaged or lost in transit during shipping and the ship to bidder(s) agree all claims shall exist solely against the shipping carrier who handled the item during shipping. All insurance claims must be file by the bidder(s) who suffered damage or loss. 15. No bidder(s) item payments shall be refundable in event the winning bidder(s) abandons an item (s) and/or refuses to pay for and/or arrange for shipping, when shipping is declined by the consignor(s)/seller(s) due to size or other prohibitions. 15.a. Bidder(s) agree to forfeit all rights to property, including any monies paid, in event the winning bidder(s) fails to make appropriate arrangements and payments for shipping of over sized items within thirty (30) days of close of auction. 15.b.2. in event any item remains in the auction house past thirty (30) days from close of auction. 16. Firearms are sold to US citizens only and are shipped within the United States only. 16.a. Online firearms auctions are shipped to a federal firearms licensee only. 16.b. Only federal licensed firearms dealers may ship a firearm across a state line or to any person, unless a firearm owner is shipping a gun to a federal licensed dealer, and the shipping must be sent by Federal Express of UPS. 16.c. Only the actual purchaser of a firearm may receive the firearm, no straw purchaser is permitted. 16.d. When a bidder(s) wins a firearm at auction, he/she must furnish a ship to firearms license copy of the federal firearms dealer license to dwightangelcompanies@yahoo.com within five (5) days of close of auction. 16.e. Any bidder(s) of a firearm must provide payment within 24 hours of close of auction. 16.f. After five (5) days from auction close, if a ship to federal firearms licensed dealer license copy has not been submitted to angel.dwight@yahoo.com the firearm will be placed in secure storage at the rate of five ($5.00) per day in storage until a federal firearms licensed dealer copy is provided by email, not to exceed 30 days in storage in totality. 16.g. PROVIDED no firearm shall be stored after thirty (30) days from close of auction and on the 31st day from close of auction, if no federal firearms licensed dealer copy has been received the winning bidder(s) shall FORFEIT all monies and fees, and loose any rights to the firearm, by virtute of BIDDER(S) DEFAULT, which is agreed to by the bidder(s). 17. Bidder(s) and/or Consignor(s) agree to these terms of auction by registering, bidding and/or participating in any auction. 18. Bidder(s) may direct any concerns, disputes or questions an e mail: angel.dwight@yahoo.com. 19. Any section or provision of this contract determined to be invalid by a court of competent jurisdiction shall not invalidate other sections or provisions contained herein. 20. The venue of this contract shall be designated in Gadsden County, Florida and the Gadsden County, Florida Court jurisdiction. 21. These terms numbered 1-21 shall consist of the complete and total auction contract, terms and provisions, and no verbal statements whatsoever shall apply to this contract. Bidder(s) and consignor(s) are in full agreement to these terms as indicated by placing a bid or listing an item at auction. IF YOU ARE NOT IN COMPLETE AGREEMENT TO THESE TERMS, DO NOT USE THIS WEBSITE AND/OR PARTICIPATE IN ANY AUCTIONS CONDUCTED BY DANGELCO DWIGHT ANGEL COMPANIES INCLUDING ANY AND/OR ALL ACTIONS OF ALL DIVISIONS, DBA'S, BRANDS AND TRADEMARKS. DO NOT REGISTER, DO NOT PLACE A BID, DO NOT LIST ANY ITEM FOR AUCTION. All goods specified as new, are new, sold as is. All goods not specified as new are used goods, sold as is. Action terms, all goods sold as is, no returns, no cancellations. Allow 10-20 days for shipping completion, from the date payment is received. Shipping is actual cost to ship billed as shipping once the item(s) are shipped. We combine shipping and use Postal Service flat rate boxes when possible. All boxes shipped are charged a $2.50 handling charge. We charge $ 2.50 per box shipped handling fee. When an auction closes please submit payment for auction winnings! We accept money orders and credit cards via Square Payments. Our business name on Square is Midway Auction House and our e mail at square is angel.dwight@yahoo.com. Florida residents pay 7.5% sales tax. Buyer's premium is taxed. Lot 3: Davis P-380, 380 caliber, semi automatic pistol, no mag,nickle plated. 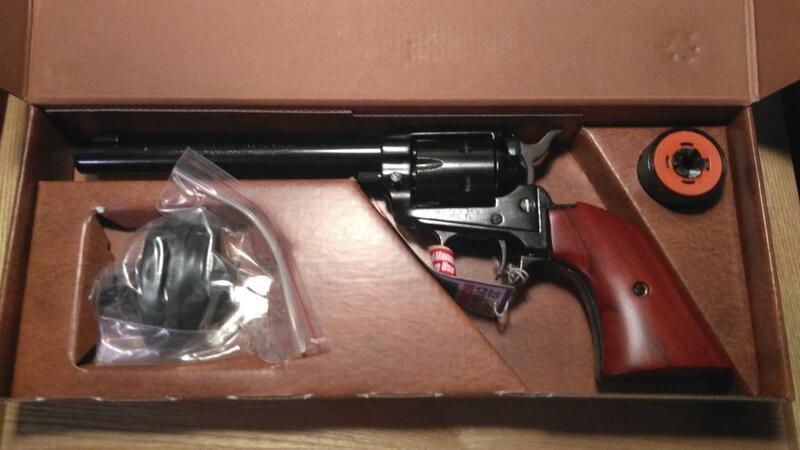 Description: H&R Model 922, 22 caliber, 9 shot revolver, good condition, good lockup. Lot 7: Heritage Arms Rough Rider 22 caliber, 22 and 22 magnum cylinders, 6 1/2" barrel, new in the box! Lot 10: H & K SL7 Caliber 308 (NEW) Made in W. Germany, Never Fired except by factory. Lot 11: Ruger Number 1 Caliber 308 Mint Condition but used. Lot 12: Mauser Bolt Action by Parker Hale (Birmingham, England) in caliber 30-06 marked Safari on on the barrel. Rebuilt 30 years ago. Held in storage 30 years by former Air Calvary Gun Shop owner. Lot 14: 1886 Winchester 45-90, Octogon 27" Barrel, Restored 30 years ago, new finish wood and metal. NOT A REPRODUCTION - AN ORIGINAL REFINISHED. Description: 1886 Winchester 45-90, Restored 30 years ago, new finish wood and metal. NOT A REPRODUCTION - AN ORIGINAL REFINISHED. Lot 15: Smith & Wesson Model 1500 Varmint Model Caliber 22-250 Excellent with a Harris Bipod. Description: Smith & Wesson Model 1500 Varmint Model Caliber 22-250 Excellent with a Harris Bipod. Scoped as well 3X9 Redfield. Lot 16: Benelli M2 20-gauge Realtree Used but Mint! 25" Barrel, vent rib. Description: Benelli 20-gauge Realtree Used but Mint! Lot 17: Beretta (Made in Italy) 12 ga. Magnum, Model A30, vent rib, 29"Barrel. Description: Beretta (Made in Italy) 12 ga. Magnum, Model A30, vent rib, 29"Barrel. Lot 18: Winchester Model 1882,Caliber 38 W.C.F. , missing one minor screw, otherwise in great condition. Description: Winchester Model 1882,Caliber 38 W.C.F. , missing one minor screw, otherwise in great condition.